Fernandes, Jorge M Riera, Pedro and Cantú, Francisco 2019. The Politics of Committee Chairs Assignment in Ireland and Spain. Parliamentary Affairs, Vol. 72, Issue. 1, p. 182. Chaturvedi, Neilan S. 2018. Filling the Amendment Tree: Majority Party Control, Procedures, and Polarization in the U.S. Senate. American Politics Research, Vol. 46, Issue. 4, p. 724. Magleby, Daniel B Monroe, Nathan W and Robinson, Gregory 2018. Amendment Politics and Agenda Setting: A Theory with Evidence from the US House of Representatives1. The Journal of Law, Economics, and Organization, Vol. 34, Issue. 1, p. 108. Fowler, Linda L. and Marshall, Bryan W. 2017. Veto-Proof Majorities, Legislative Procedures, and Presidential Decisions, 1981–2008. Political Research Quarterly, Vol. 70, Issue. 2, p. 348. Chaturvedi, Neilan S. 2017. Kings of the Hill? An Examination of Centrist Behavior in the U.S. Senate. Social Science Quarterly, Vol. 98, Issue. 5, p. 1250. Chiou, Fang-Yi and Rothenberg, Lawrence S. 2016. Presidential unilateral action: partisan influence and presidential power. Public Choice, Vol. 167, Issue. 1-2, p. 145. Arceneaux, Kevin Johnson, Martin Lindstädt, René and Vander Wielen, Ryan J. 2016. The Influence of News Media on Political Elites: Investigating Strategic Responsiveness in Congress. American Journal of Political Science, Vol. 60, Issue. 1, p. 5. Pyeatt, Nicholas and Yanus, Alixandra B. 2016. Gendered Perceptions and Reelection Incentives in the U.S. House of Representatives. Journal of Women, Politics & Policy, Vol. 37, Issue. 3, p. 295. Jang, Jinhyeok 2016. Taiwan, still as a baseline case supporting for the differing mandate hypothesis. Asian Journal of Comparative Politics, Vol. 1, Issue. 2, p. 215. Egar, William T. 2016. Tarnishing Opponents, Polarizing Congress: The House Minority Party and the Construction of the Roll-Call Record. Legislative Studies Quarterly, Vol. 41, Issue. 4, p. 935. Buttice, Matthew K. and Highton, Benjamin 2016. Assessing the Mechanisms of Senatorial Responsiveness to Constituency Preferences. American Politics Research, Vol. 44, Issue. 5, p. 767. Roberts, Jason M. Smith, Steven S. and Haptonstahl, Stephen R. 2016. The Dimensionality of Congressional Voting Reconsidered. American Politics Research, Vol. 44, Issue. 5, p. 794. Lynch, Michael S. Madonna, Anthony J. and Roberts, Jason M. 2016. The Cost of Majority-Party Bias: Amending Activity under Structured Rules. Legislative Studies Quarterly, Vol. 41, Issue. 3, p. 633. Green, Matthew N. 2016. The Multiple Roots of Party Loyalty: Explaining Republican Dissent in the U.S. House of Representatives. Congress & the Presidency, Vol. 43, Issue. 1, p. 103. Anderson, Sarah E. Butler, Daniel M. and Harbridge, Laurel 2016. Legislative Institutions as a Source of Party Leaders' Influence. Legislative Studies Quarterly, Vol. 41, Issue. 3, p. 605. Jenkins, Jeffery A. and Monroe, Nathan W. 2016. On Measuring Legislative Agenda-Setting Power. American Journal of Political Science, Vol. 60, Issue. 1, p. 158. Carson, Jamie L. Madonna, Anthony J. and Owens, Mark E. 2016. Regulating the Floor. American Politics Research, Vol. 44, Issue. 1, p. 56. Crespin, Michael H. Madonna, Anthony Sievert, Joel and Ament-Stone, Nathaniel 2015. The Establishment of Party Policy Committees in the U.S. Senate: Coordination, Not Coercion*. Social Science Quarterly, Vol. 96, Issue. 1, p. 34. Ramey, Adam 2015. Bringing the minority back to the party: An informational theory of majority and minority parties in Congress. Journal of Theoretical Politics, Vol. 27, Issue. 1, p. 132. Binder, Sarah A. 2015. Challenges Ahead for Legislative Studies. Legislative Studies Quarterly, Vol. 40, Issue. 1, p. 5. 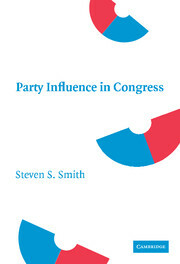 Party Influence in Congress challenges current arguments and evidence about the influence of political parties in the US Congress. Steven S. Smith argues that theory must reflect policy, electoral, and collective party goals. These goals call for flexible party organizations and leadership strategies. They demand that majority party leaders control the flow of legislation; package legislation and time action to build winning majorities and attract public support; work closely with a president of their party; and influence the vote choices for legislators. Smith observes that the circumstantial evidence of party influence is strong, multiple collective goals remain active ingredients after parties are created, party size is an important factor in party strategy, both negative and positive forms of influence are important to congressional parties, and the needle-in-the-haystack search for direct influence continues to prove frustrating. Abramowitz, Alan I. 1980. Is the Revolt Fading? A Note on Party Loyalty Among Southern Democratic Congressmen. The Journal of Politics 42 (2):568–72. Abramowitz, Alan I. 1994. Issue Evolution Reconsidered: Racial Attitudes and Partisanship in the U.S. Electorate. American Journal of Political Science 38 (1):1–24. Agranoff, Robert. 1972. The New Style of Campaigning: The Decline of Party and the Rise of Candidate Centered Technology. In The New Style in Election Campaigns. Boston: Holbrook Press. Albright, Spencer D. 1942. The American Ballot. Washington, D.C.: American Council on Public Affairs. Aldrich, John H., and Rohde, David W.. 1995. Theories of the Party in the Legislature and the Transition to Republican Rule in the House. In Annual Meeting of the American Political Science Association. Chicago, IL, August 31–September 3. Aldrich, John H., and Rohde, David W.. 1997. The Transition to Republican Rule in the House: Implications for Theories of Congressional Politics. Political Science Quarterly 112 (4):541–67. Aldrich, John H., and David W. Rohde. 2000a. The Consequences of Party Organization in the House: The Role of the Majority and Minority Parties in Conditional Party Government. In Polarized Politics: Congress and the President in a Partisan Era, edited by Bond, J. R. and Fleisher, R.. Washington, DC: CQ Press. Aldrich, John H., and Rohde, David W.. 2000b. The Republican Revolution and the House Appropriations Committee. Journal of Politics 62 (1):1–33. Aldrich, John H., and David W. Rohde. 2004. Congressional Committees in a Partisan era. In Congress Reconsidered, edited by Dodd, L. C. and Oppenheimer, B. I.. Washington, D.C.: CQ Press. Aldrich, John H., Mark M. Berger, and David W. Rohde. 2002. The Historical Variability in Conditional Party Government, 1877–1994. In Parties, Procedure and Policy: Essays on the History of Congress, edited by Brady, D. and McCubbins, M.. Stanford: Stanford University Press. Ansolabehere, Stephen D. Jr., Snyder, James M., and Stewart, Charles III. 2001. The Effects of Party and Preferences on Congressional Roll-Call Voting. Legislative Studies Quarterly XXVI (4):533–72. Bach, Stanley, and Smith, Steven S.. 1988. Managing Uncertainty in the House of Representatives: Adaptation and Innovation in Special Rules. Washington, D.C.: Brookings Institution Press. Bawn, Kathleen. 1998. Congressional Party Leadership: Utilitarian versus Majoritarian Incentives. Legislative Studies Quarterly 23 (2):219–43. Behringer, Courtney L., and Evans, C. Lawrence. 2006. Parties, Preferences, and the House Whip Process. In Annual Meeting of the Southern Political Science Association. Atlanta, GA.
Binder, Sarah A. 1996. The Partisan Basis of Procedural Choice: Allocating Parliamentary Rights in the House, 1789–1990. American Political Science Review 90 (1):8–20. Binder, Sarah A. 1997. Minority Rights, Majority Rule: Partisanship and the Development of Congress. New York: Cambridge University Press. Binder, Sarah A. 2003. Stalemate: Causes and Consequences of Legislative Gridlock. Washington, D.C.: Brookings Institution Press. Binder, Sarah A. 2006. Parties and Institutional Choice Revisited. Legislative Studies Quarterly 31 (4):413–532. Binder, Sarah A., Lawrence, Eric, and Maltzman, Forrest. 1999. Uncovering the Hidden Effect of Party. Journal of Politics 61 (3):815–831. Binder, Sarah A., Lawrence, Eric, and Smith, Steven S.. 2002. Tracking the Filibuster. American Politics Research 30 (2):406–422. Binder, Sarah A., and Smith, Steven S.. 1997. Politics or Principle: Filibustering in the Senate. Washington, D.C.: Brookings Institution Press. Black, Duncan. 1958. The Theory of Committee and Elections. Cambridge, U.K.: Cambridge University Press. Bolling, Richard Walker. 1974. Power in the House: A history of the leadership of the House of Representatives. New York: Capricorn Books. Bond, Jon R., and Fleisher, Richard. 1990. The President in the Legislative Arena. Chicago: University of Chicago Press. Brady, David W. 1985. A Reevaluation of Realignments in American Politics: Evidence from the House of Representatives. American Political Science Review 79 (1):28–49. Brady, David W. 1988. Critical Elections and Congressional Policy-Making. Stanford: Stanford University Press. Brady, David W., Brody, Richard, and Epstein, David. 1989. Heterogeneous Parties and Political Organization: The U.S. Senate, 1880–1920. Legislative Studies Quarterly 14 (2):205–23. Brady, David W., and Epstein, David. 1997. Intraparty Preferences, Heterogeneity, and the Origins of the Modern Congress: Progressive Reformers in the House and Senate, 1890–1920. Journal of Law, Economics, and Organization 13 (1):26–49. Brady, David W., and Lynn, Naomi B.. 1973. Switched-Seat Congressional Districts: Their Effect on Party Voting and Public Policy. American Journal of Political Science 17 (3):528–43. Brady, David, and Sinclair, Barbara. 1984. Building Majorities for Policy Changes in the House of Representatives. Journal of Politics 46 (4):1033–60. Brams, Steven J., and O'Leary, Michael K. 1970. An Axiomatic Model of Voting Bodies. American Political Science Review 64 (2):449–70. Brown, George Rothwell. 1922. The leadership of Congress, by George Rothwell Brown. Indianapolis,: The Bobbs-Merrill company. Bullock, Charles S. 1976. Motivations for U.S. Congressional Committee Preferences: Freshmen of the 92d Congress. Legislative Studies Quarterly 1:201–12. Burden, Barry C., and Frisby, Tammy M.. 2004. Preferences, Partisanship, and Whip Activity in the U.S. House of Representatives. Legislative Studies Quarterly XXIX (4):569–90. Calvert, Randall L., and Fenno, Richard F. Jr. 1994. Strategy and Sophisticated Voting in the Senate. Journal of Politics 56 (2):349–76. Cameron, Charles M. 2000. Veto Bargaining: Presidents and the Politics of Negative Power. Cambridge: Cambridge University Press. Caro, Robert A. 2002. The Years of Lyndon Johnson: Master of the Senate. New York: Alfred A. Knopf. Chiu, Chang-Wei. 1928. The Speaker of the House of Representatives Since 1896. New York: Columbia University Press. Clausen, Aage R. 1967. The Measurement of Legislative Group Behavior. Midwest Journal of Political Science 11 (2):212–24. Clausen, Aage R. 1973. How Congressmen Decide. New York: St. Martin's Press. Clausen, Aage R., and Cheney, Richard B.. 1970. A Comparative Analysis of Senate House Voting on Economic and Welfare Policy: 1953–1964. The American Political Science Review 64 (1):138–52. Clausen, Aage R., and Horn, Carl E.. 1977. The Congressional Response to a Decade of Change: 1963–1972. The Journal of Politics 39 (3):624–66. Coase, Ronald. 1960. The Problem of Social Cost. Journal of Law and Economics 3:1–44. Cohen, Jeffrey. 1981. The Dynamics of Party Voting in Congress, 1955–78: A Cohort Model. Political Behavior 3 (3):211–27. Coleman, James S. 1987. Microfoundations and Macrosocial Behavior. In The Micro-Macro Link, edited by Alexander, J. C., Giesen, B., Munch, R., and Smelser, N. J.. Berkeley: University of California Press. Cooper, Joseph, and Brady, David. 1981. Institutional Context and Leadership Style: The House From Cannon to Rayburn. American Political Science Review 75 (2):411–25. Cooper, Joseph, David W. Brady, and Patricia Hurley. 1977. The Electoral Basis of Party Voting: Patterns and Trends in the U.S. House of Representatives, 1887–1969. In The Impact of the Electoral Process, edited by Maisel, L. and Cooper, J.. Beverly Hills, CA: Sage. Covington, Cary R. 1987. Mobilizing Congressional Support for the President: Insights from the 1960s. Legislative Studies Quarterly 12:77–95. Cox, Gary W. 2001. Agenda Setting in the U.S. House: A Majority-Party Monopoly?Legislative Studies Quarterly 26 (2):185–210. Cox, Gary W., Andrea Campbell, and Mathew D. McCubbins. 2002. Agenda Power in the Senate, 1877 to 1986. In Party, Process, and Political Change in Congress: New Perspectives on the History of Congress, edited by Brady, D. W. and McCubbins, M. D.. Stanford: Stanford University Press. Cox, Gary W., and McCubbins, Mathew D.. 1991. On the Decline of Party Voting in Congress. Legislative Studies Quarterly 16 (4):547–70. Cox, Gary W., and McCubbins, Mathew D.. 1993. Legislative Leviathan: Party Government in the House. Berkeley: University of California Press. Cox, Gary W., and McCubbins, Mathew D.. 1997. Toward a Theory of Legislative Rules Changes: Assessing Schickler and Rich's Evidence. American Journal of Political Science 41 (4):1376–86. Cox, Gary W., and Mathew D. McCubbins. 2002. Agenda Power in the US House of Representatives, 1877–1986. In Parties, Procedure and Policy: Essays on the History of Congress, edited by Brady, D. W. and McCubbins, M. D.. Stanford: Stanford University Press. Cox, Gary W., and Poole, Keith T.. 2002. On Measuring Partisanship in Roll-Call Voting: The U.S. House of Representatives, 1877–1999. American Journal of Political Science 46 (3):477–89. Crane, Wilder Jr. 1960. A Caveat on Roll-Call Studies of Party Voting. Midwest Journal of Political Science 4 (3):237–49. Crombez, Christophe, Krehbiel, Keith, and Groseclose, Tim. 2005. “Gatekeeping.” Journal of Politics 68 (2):322–34. Crook, Sara Brandes, and Hibbing, John R.. 1985. Congressional Reform and Party Discipline: The Effects of Changes in the Seniority System on Party Loyalty in the US House of Representatives. British Journal of Political Science 15 (2):207–26. Davidson, Roger, and Oleszek, Walter. 1977. Congress Against Itself. Bloomington: Indiana University Press. Davis, Otto A., and Melvin J. Hinich. 1966. A Mathematical Model of Policy Formation in a Democratic Society. In Mathematical Applications in Political Science II, edited by Bernd, J. L.. Dallas: Southern Methodist University Press. Davis, Otto A., Hinich, Melvin J., and Ordeshook, Peter C.. 1970. An Expository Development of a Mathematical Model of the Electoral Process. American Political Science Review 64:426–48. Deckard, Barbara. 1976. Electoral Marginality and Party Loyalty in House Roll Call Voting. American Journal of Political Science 20 (3):469–81. Deering, Christopher J., and Smith, Steven S.. 1983. Changing Motives for Committee Preferences of New Members of the U.S. House. Legislative Studies Quarterly VIII (2):271–81. Deschler, Lewis, Brown, Wm Holmes, and Cannon, Clarence. 1977. Deschler's Precedents of the United States House of Representatives. Washington, D.Cl. : Supt. of Docs., U.S. G.P.O. Dion, Douglas. 1997. Turning the Legislative Thumbscrew. Ann Arbor: University of Michigan Press. Dion, Douglas, and Huber, John D.. 1996. Procedural Choice and the House Committee on Rules. Journal of Politics 58 (1):25–53. Dion, Douglas, and Huber, John D.. 1997. Sense and Sensibility: The Role of Rules. American Journal of Political Science 41 (3):945–57. Dodd, Lawrence C. 1977. Congress and the Quest for Power. In Congress Reconsidered, edited by Dodd, L. C. and Oppenheimer, B. I.. New York: Praeger. Dodd, Lawrence C. 1978. The Expanded Roles of the House Democratic Whip Systems: The 93d and 94th Congresses. Congressional Studies 7:27–56. Dodd, Lawrence C., and Oppenheimer, Bruce I.. 1977. Congress Reconsidered. New York: Praeger. Dodd, Lawrence C., and Oppenheimer, Bruce I.. 1997. Congress Reconsidered. 6th ed. Washington, D.C.: CQ Press. Dodd, Lawrence C., and Terry Sullivan. 1981. Majority Party Leadership and Partisan Vote Gathering: The House Democratic Whip System. In Understanding Congressional Leadership, edited by Mackaman, F. H.. Washington., D.C.: CQ Press. Donald, David Herbert. 1996. Charles Sumner. 1st Da Capo Press ed. New York: Da Capo Press. Edwards, George C. 1984. Presidential Party Leadership in Congress. In Presidents and Their Parties: Leadership or Neglect? edited by Harmel, R.. New York: Praeger. Edwards, George C. 1989. At the Margins: Presidential Leadership of Congress. New Haven: Yale University Press. Evans, C. Lawrence, and Walter J. Oleszek. 1999. Procedural Features of House Republican Rule. In New Majority or Old Minority: the Impact of Republicans on Congress, edited by Rae, N. C. and Campbell, C. C.. Lanham, MD: Rowman and Littlefield. Fenno, Richard F. Jr. 1973. Congressmen in Committees. Boston: Little, Brown. Fiellin, Alan. 1962. The Functions of Informal Groups in Legislative Institutions. Journal of Politics 24:72–91. Fiorina, Morris P. 1974. Representatives, Roll Calls, and Constituencies. New York: D.C. Heath and Company. Follett, Mary Parker. 1909. The Speaker of the House of Representatives. New York: Longmans, Green and Co.
Fox, Douglas M., and Clapp, Charles H.. 1970a. The House Rules Committee and the Programs of Kennedy and Johnson Administrations. Midwest Journal of Political Science 14 (4):667–72. Fox, Douglas M., and Clapp, Charles H.. 1970b. The House Rules Committee's Agenda-Setting Function, 1961–1968. The Journal of Politics 32 (2):440–3. Frohlich, Norman, Oppenheimer, Joe, and Young, Oran. 1971. Political Leadership and Collective Goods. Princeton: Princeton University Press. Froman, Lewis A. Jr., and Ripley, Randall B.. 1965. Conditions for Party Leadership: The Case of the House Democrats. American Political Science Review 59 (1):52–63. Galloway, George. 1969. History of the House of Representatives. New York: Thomas Crowell. Gamm, Gerald, and Steven S. Smith. 1998. Last Among Equals: The Senate's Presiding Officer. Paper read at Annual Meeting of the American Political Science Association, at Boston. Gamm, Gerald, and Steven S. Smith. 2000. Last Among Equals: The Presiding Officer of the Senate. In Esteemed Colleagues: Civility and Deliberation in the United States Senate, edited by Loomis, B.. Washington, D.C.: Brookings Institution. Gamm, Gerald, and Steven S. Smith. 2002. The Emergence of Senate Party Leadership. In Senate Exceptionalism, edited by Oppenheimer, B. I.. Columbus: Ohio State University Press. Greenstein, Fred I., and Jackson, Elton F.. 1963. A Second Look at the Validity of Roll-Call Analysis. Midwest Journal of Political Science 7 (2):156–66. Grumm, John G. 1965. The Systematic Analysis of Blocs in the Study of Legislative Behavior. Western Political Quarterly 18 (2):350–62. Hager, Gregory L., and Talbert, Jeffery C.. 2000. Look for the Party Label: Party Influences on Voting in the U.S. House. Legislative Studies Quarterly 25 (1):75–99. Hinich, Melvin J., and Enelow, James M.. 1984. The Spatial Theory of Voting. Cambridge: Cambridge University Press. Huitt, Ralph K. 1961. Democratic Party Leadership in the Senate. American Political Science Review 55:333–44. Hurwitz, Mark S., Moiles, Roger J., and Rohde, David W.. 2001. Distributive and Partisan Issues in Agriculture Policy in the 104th House. American Political Science Review 95 (4):911–22. Jackson, John E. 1971. Statistical Models of Senate Roll Call Voting. The American Political Science Review 65 (2):451–70. Jackson, John E., and Kingdon, John W.. 1992. Ideology, Interest Group Score, and Legislative Votes. American Journal of Political Science 36 (August):805–23. Jackson, Mathew O., and Moselle, Boaz. 2002. Coalition and Party Formation in a Legislative Voting Game. Journal of Economic Theory 103 (1):49–87. Jones, Charles. 1961. Representation in Congress: The Case of the House Agriculture Committee. American Political Science Review 55 (June):358–67. Jones, Charles O. 1970. The Minority Party in Congress. Boston: Little, Brown. Karabel, Jerome. 2005. The Chosen: The Hidden History of Admission and Exclusion at Harvard, Yale, and Princeton. Boston: Houghton Mifflin Co.
Katz, Jonathan, and Sala, Brian. 1996. Careerism, Committee Assignments, and the Electoral Connection. American Political Science Review 90:21–33. Kernell, Samuel. 1986. Going Public: New Strategies of Presidential Leadership. Washington, D.C.: CQ Press. Kernell, Samuel. 1997. Going Public: New Strategies of Presidential Leadership. 3rd ed. Washington, D.C.: CQ Press. Kessel, John H. 1964. The Washington Congressional Delegation. Midwest Journal of Political Science 8:1–21. King, David C., and Zeckhauser, Richard J.. 2003. Congressional Vote Options. Legislative Studies Quarterly XXVIII (3):387–412. Kingdon, John W. 1973. Congressmen's Voting Decisions. New York: Harper and Row. Koford, Kenneth. 1989. Dimensions in Congressional Voting. The American Political Science Review 83 (3):949–62. Krehbiel, Keith. 1988. Spatial Models of Legislative Choice. Legislative Studies Quarterly 13 (3):259–319. Krehbiel, Keith. 1991. Information and Legislative Organization. Ann Arbor: University of Michigan Press. Krehbiel, Keith. 1993. Where's the Party?British Journal of Political Science 23:235–66. Krehbiel, Keith. 1995. Cosponsors and Wafflers from A to Z. American Journal of Political Science 39 (4):906–23. Krehbiel, Keith. 1997a. Rejoinder to ‘Sense and Sensibility’. American Journal of Political Science 41:958–64. Krehbiel, Keith. 1997b. Restrictive Rules Reconsidered. American Journal of Political Science 41 (July):919–44. Krehbiel, Keith. 2000. Party Discipline and Measures of Partisanship. American Journal of Political Science 44:212–27. Krehbiel, Keith. 2003. Asymmetry in Party Influence: Reply. Political Analysis 11:108–9. Krehbiel, Keith. 2005. Pivots. Stanford: Stanford University Graduate School of Business. Krehbiel, Keith. 2006. Pivots. In Handbook of Political Economy, edited by Weingast, B. R. and Wittman, D.. New York: Oxford University Press. Krehbiel, Keith, Adam Meirowitz, and Jonathan Woon. 2005. Testing Theories of Lawmaking. In Social Choice and Strategic Decisions, edited by Austen-Smith, D. and Duggan, J.. New York: Springer. Krehbiel, Keith, and Alan Wiseman. 1999. Joseph G. Cannon: Majoritarian from Illinois. Paper read at Conference on the History of Congress, January 15–16, at Stanford University. Kuklinski, James H. 1977. District Competitiveness and Legislative Roll-Call Behavior: A Reassessment of the Marginality Hypothesis. American Journal of Political Science 21 (3):627–38. Kuklinski, James H., and Elling, Richard C.. 1977. Representational Role, Constituency Opinion, and Legislative Roll-Call Behavior. American Journal of Political Science 21 (1):135–47. Lawrence, Eric D. 2004. Essays on Procedural Development in the U.S. Congress, Ph.D. Dissertation, University of Minnesota. Lawrence, Eric, Maltzman, Forrest, and Smith, Steven S.. 2005. Changing Patterns of Party Effects in Congressional Voting. In Annual Meeting of the American Political Science Association. Washington, D.C.
Lawrence, Eric, Maltzman, Forrest, and Smith, Steven S.. 2006. Who Wins? Party Effects in Legislative Voting. Legislative Studies Quarterly 31 (1):33–69. Lawrence, Eric, and Steven S. Smith. 1997. Party Control of Committees in the Republican Congress. In Congress Reconsidered, edited by Dodd, L. C. and Oppenheimer, B. I.. Washington, D.C.: CQ Press. Light, Paul C. 1983. The President's Agenda: Domestic Policy Choice from Kennedy to Carter. Baltimore: Johns Hopkins University Press. Lott, Trent. 2005. Herding Cats: A Life in Politics. New York: Regan Books. Ludington, Arthur C. 1911. American Ballot Laws, 1888–1910, edited by N. Y. S. E. Department: University of the State of New York, Albany. MacNeil, Neil. 1963. Forge of Democracy: The House of Representatives. New York: McKay. MacRae, Duncan. 1958. Dimensions of Congressional Voting. Berkeley: University of California Press. MacRae, Duncan Jr. 1965. A Method for Identifying Issues and Factions From Legislative Votes. American Political Science Review 59 (4):909–26. Maltzman, Forrest. 1997. Competing Principals: Committees, Parties, and the Organization of Congress. Ann Arbor: University of Michigan Press. Marshall, Bryan W. 2002. Explaining the Role of Restrictive Rules in the Postreform House. Legislative Studies Quarterly 27 (1):61–85. Martin, Andrew D. and Quinn, Kevin M.. 2002. Dynamic Ideal Point Estimation via Markov Chain Monte Carlo for the U.S. Supreme Court, 1953–1999. Political Analysis 10 (2):134–53. Matthews, Donald R., and Stimson, James A.. 1975. Yeas and Nays: Normal Decision-Making in the U.S. House of Representatives. New York: Wiley. Mayhew, David R. 1991. Divided We Govern: Party Control, Lawmaking, and Investigating: 1946–1990. New Haven: Yale University Press. McCarty, Nolan, Poole, Keith T., and Rosenthal, Howard. 2001. The Hunt for Party Discipline in Congress. American Political Science Review 95 (3):673–87. Neustadt, Richard. 1990. Presidential Power and the Modern Presidents: The Politics of Leadership from Roosevelt to Reagan. New York: Free Press. Nimmo, Dan. 1970. The Political Persuaders: The Techniques of Modern Election Campaigns. Englewood Cliffs, NJ: Prentice-Hall. Nokken, Timothy P. 2000. Dynamics of Congressional Loyalty: Party Defection and Roll-Call Behavior, 1947–97. Legislative Studies Quarterly 25 (3):417–44. Nokken, Timothy P., and Poole, Keith T.. 2004. Congressional Party Defection in American History. Legislative Studies Quarterly 29 (4):545–68. Oleszek, Walter J. 1985. Majority and Minority Whips of the Senate. Washington, D.C.: Government Printing Office. Olson, Mancur. 1966. The Logic of Collective Action. Cambridge: Harvard University Press. Peabody, Robert L. 1963. The Enlarged Rules Committee. In New Perspectives on the House of Representatives, edited by Peabody, R. L. and Polsby, N. W.. Chicago: Rand McNally and Co.
Peabody, Robert L. 1976. Leadership in Congress: Stability, Succession, and Change. Boston: Little, Brown. Poole, Keith T. 1988. Recent Developments in Analytical Models of Voting in the U.S. Congress. Legislative Studies Quarterly 13 (1):117–33. Poole, Keith T., and Daniels, R. Steven. 1985. Ideology, Party, and Voting in the U.S. Congress, 1959–1980. American Political Science Review 79 (2):373–99. Poole, Keith T., and Rosenthal, Howard. 1985. A Spatial Model for Legislative Roll Call Analysis. American Journal of Political Science 29 (2):357–84. Poole, Keith T., and Rosenthal, Howard. 1991. Patterns of Congressional Voting. American Journal of Political Science 35 (1):228–78. Poole, Keith T., and Rosenthal, Howard. 1996. Congress: A Political-Economic History of Roll Call Voting. New York: Oxford University Press. Poole, Keith T., Rosenthal, Howard, and Koford, Kenneth. 1991. On Dimensionalizing Roll Call Votes in the U.S. Congress. The American Political Science Review 85 (3):955–76. Price, Hugh Douglas. 1962. Race, Religion, and the Rules Committee: The Kennedy Aid-to-Education Bills. In The Uses of Power, edited by Westin, A. F.. New York: Harcourt, Brace, and World. Ray, Bruce A., and Smith, Steven S.. 1983. The Impact of Congressional Reform: House Democratic Committee Assignments. Congress and The Presidency (Fall): 11–22. Rice, Stuart A. 1924. Farmers and Workers in American Politics. Ph.D. Dissertation, Columbia University, New York. Rice, Stuart A. 1925. The Behavior of Legislative Groups: A Method of Measurement. Political Science Quarterly 40 (1):60–72. Rice, Stuart A. 1928. Quantitative Methods in Politics. New York: Knopf. Ripley, Randall B. 1964. The Party Whip Organizations in the United States House of Representatives. American Political Science Review 58 (3):561–76. Ripley, Randall B. 1967. Party Leaders in the House of Representatives. Washington, D.C.: Brookings Institution. Ritchie, Donald A. 1998. Minutes of the U.S. Senate Democratic Conference, 1903–1964. Washington, D.C.: Government Printing Office. Roberts, Jason M., and Steven S. Smith. Forthcoming. The Evolution of Agenda-Setting Institutions in Congress: Path Dependency in House and Senate Institutional Development. In Process, Party and Policy Making: New Advances in the Study of the History of Congress, edited by Brady, D. W. and Mccubbins, M. D.. Palo Alto: Stanford University Press. Roberts, Jason M., and Smith, Steven S.. 2003. Procedural Contexts, Party Strategy, and Conditional Party Voting in the U.S. House of Representatives, 1971–2000. American Journal of Political Science 47 (April):305–17. Robinson, James A. 1959. The Role of the Rules Committee in Arranging the Program of the U.S. House of Representatives. The Western Political Quarterly 12 (3):653–69. Robinson, James A. 1961. The Role of the Rules Committee in Regulating Debate in the U.S. House of Representatives. Midwest Journal of Political Science 5 (1):59–69. Robinson, James A. 1963. The House Rules Committee. Indianapolis: Bobbs-Merrill. Rohde, David W. 1991. Parties and Leaders in the Postreform House. Chicago: University of Chicago Press. Rohde, David W. 1992. Electoral Forces, Political Agendas, and Partisanship in the House and Senate. In The Postreform Congress, edited by Davidson, R.. New York:. St. Martins Press. Rohde, David W. 1994. Parties and Committees in the House: Member Motivations, Issues, and Institutional Arrangements. Legislative Studies Quarterly 19 (3):341–59. Rothman, David J. 1966. Politics and Power: The United States Senate, 1869–1901. Cambridge: Harvard University Press. Rybicki, Elizabeth, Steven S. Smith, and Ryan J. Vander Wielen. 2003. Congressional Conference Committee Bias, 1963–2002. Paper presented at the Annual Meeting of the American Political Science Association. Philadelphia. Sabato, Larry. 1981. The Rise of Political Consultants: New Ways of Winning Elections. New York: Basic Books. Schwartz, Thomas. 1989. Why Parties? Mimeo, University of California at Los Angeles. Shannon, Wayne. 1968a. Electoral Margins and Voting Behavior in the House of Representatives: The Case of the Eighty-Sixth and Eighty-Seventh Congresses. The Journal of Politics 30 (4):1028–45. Shannon, Wayne. 1968b. Party, Constituency, and Congressional Voting. Baton Rouge: Louisiana State University Press. Shefter, Martin. 1983. Regional Receptivity to Reform: The Legacy of the Progressive Era. Political Science Quarterly 98 (Fall):459–83. Shepsle, Kenneth A. 1978. The Giant Jigsaw Puzzle: Democratic Committee Assignments in the Modern House. Chicago: University of Chicago Press. Shepsle, Kenneth A., and Weingast, Barry R.. 1984a. Uncovered Sets and Sophisticated Voting Outcomes With Implications for Agenda Institutions. American Journal of Political Science 28 (1):49–74. Shepsle, Kenneth A., and Weingast, Barry R.. 1984b. When Do Rules of Procedure Matter?Journal of Politics 46 (1):206–21. Sinclair, Barbara. 1981a. Majority Party Leadership Strategies for Coping with the New U.S. House. Legislative Studies Quarterly 6 (3):391–414. Sinclair, Barbara. 1981b. The Speaker's Task Force in the Post-Reform House of Representatives. American Political Science Review 75 (2):397–410. Sinclair, Barbara. 1983. Majority Leadership in the U.S. House. Baltimore: Johns Hopkins University Press. Sinclair, Barbara. 1989. House Majority Party Leadership in the Late 1980s. In Congress Reconsidered, edited by Dodd, L. D. and Oppenheimer, B. I.. Washington, D.C.: CQ Press. Sinclair, Barbara. 1994. House Special Rules and the Institutional Design Controversy. Legislative Studies Quarterly 19 (November):477–94. Sinclair, Barbara. 1995a. House Special Rules and the Institutional Design Controversy. In Positive Theories of Congressional Institutions, edited by Shepsle, K. and Weingast, B.. Ann Arbor: University of Michigan Press. Sinclair, Barbara. 1995b. Legislators, Leaders, and Lawmaking: The U.S. House of Representatives in the Postreform Era. Baltimore: Johns Hopkins University Press. Sinclair, Barbara. 2000. Unorthodox Lawmaking: New Legislative Processes in the U.S. Congress. 2nd ed. Washington, D.C.: CQ Press. Sinclair, Barbara. 2002. Do Parties Matter? In Party, Process, and Political Change in Congress: New Perspectives on the History of Congress, edited by Brady, D. W. and McCubbins, M. D.. Stanford: Stanford University Press. Smith, Steven S. 1982. The Budget Battles of 1981: The Role of the Majority Party Leadership. In American Politics and Public Policy, edited by Sindler, A. P.. Washington, D.C.: CQ Press. Smith, Steven S. 1984. Coalition Leaders in Congress: A Theoretical Perspective. Paper presented at the Annual meeting of the American Political Science Association: Washington, DC. Smith, Steven S. 1985. New Patterns of Decisionmaking in Congress. In The New Direction in American Politics, edited by Chubb, J. E. and Peterson, P. E.. Washington, D.C.: Brookings Institution. Smith, Steven S. 1989. Call to Order: Floor Politics in the House and Senate. Washington, D.C.: Brookings Institution. Smith, Steven S. 2005. Parties and Leadership in the Senate. In The Legislative Branch, edited by Quirk, P. J. and Binder, S. A.. New York: Oxford University Press. Smith, Steven S., and Deering, Christopher J.. 1990. Committees in Congress. Washington, D.C.: CQ Press. Smith, Steven S., and Flathman, Marcus. 1989. Managing the Senate Floor: Complex Unanimous Consent Agreements Since the 1950s. Legislative Studies Quarterly 14:349–74. Smith, Steven S., and Gerald Gamm. 2002. Emergence of the Modern Senate Party Organization, 1937–2002. Paper presented at the annual meeting of the American Political Science Association, Boston, Mass. Smith, Steven S., Roberts, Jason M., and Vander Wielen, Ryan J.. 2006. The American Congress. 4th ed. New York: Cambridge University Press. Snyder, James M., and Groseclose, Tim. 2000. Estimating Party Influence in Congressional Roll-Call Voting. American Journal of Political Science 44 (2):193–211. Snyder, James M. Jr., and Groseclose, Tim. 2001. Estimating Party Influence on Roll Call Voting: Regression Coefficients versus Classification Success. American Political Science Review 95 (3):689–98. Sullivan, John L., and Uslaner, Eric M.. 1978. Congressional Behavior and Electoral Marginality. American Journal of Political Science 22:536–54. Truman, David. 1951. The Governmental Process. New York: Knopf. Truman, David. 1956. The State Delegations and the Structure of Party Voting in the United States House of Representatives. American Political Science Review 50:1023–45. Truman, David B. 1959. The Congressional Party: A Case Study. New York: Wiley. Turner, Julius. 1951. Party and Constituency: Pressures on Congress, Johns Hopkins University Studies in Historical and political science. Ser. 69, No. 1. Baltimore: Johns Hopkins Press. Vander Wielen, Ryan. 2006. Conference Committees and Bias in Legislative Outcomes. Ph.D. Dissertation, Political Science, Washington University, St. Louis. Wawro, Gregory J., and Schickler, Eric. 2004. Where's the Pivot? Obstruction and Lawmaking in the Pre-Cloture Senate. American Journal of Political Science 48 (4):758–74. Wawro, Gregory, and Schickler, Eric. 2006. Filibuster: Obstruction and Lawmaking in the U.S. Senate, Princeton Studies in American Politics. Princeton, NJ: Princeton University Press. Weisberg, Herbert F. 1972. Scaling Models for Legislative Roll-Call Analysis. American Political Science Review 66 (4):1306–15. Wilcox, Clyde, and Clausen, Aage R.. 1991. The Dimensionality of Roll-Call Voting Reconsidered. Legislative Studies Quarterly (August):393–406. Yeomans, Henry Aaron. 1948. Abbott Lawrence Lowell, 1856–1943. Cambridge: Harvard University Press. Young, Garry, and Vicky Wilkins. 2005. Vote Switchers and Party Influence in the U.S. House.